WHO: TasteFood is a seasoned traveler and food blogger living in the Bay Area. WHAT: A noble destination for your fresh spring peas (but if you use frozen, we won't tell). 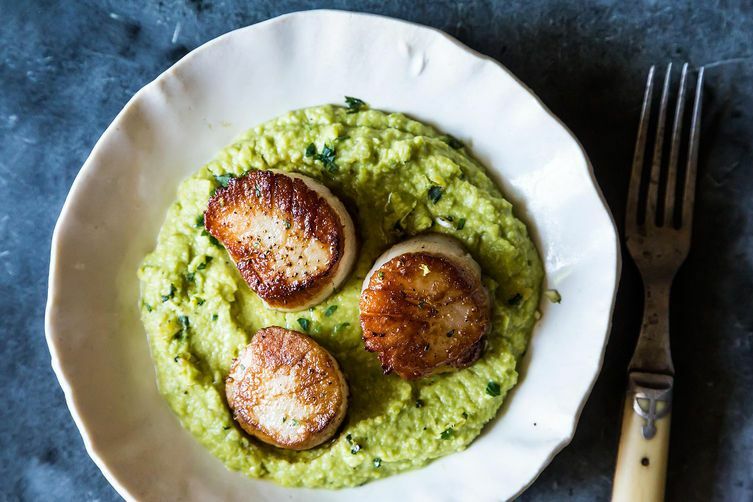 HOW: Whiz up your pea puree, sear your scallops, mix up your gremolata, and assemble. WHY WE LOVE IT: This pea puree is unlike any pea puree we've had; it's punchy, it's gingery, it's exciting. Topped with a couple of perfectly-cooked scallops and a lemony, herbaceous gremolata, you've got a dish that's fit for a dinner party. I absolutely defend Lynda for her creative cooking skills, recipe development talent and culinary integrity. I have learned so much from her and value her as a role model for all of us who share a love of food and how we prepare it in our kitchens. Many congrats Lynda at TasteFood for the Wildcard!!! I've made this dish a number of times with great success, and it's a worthy winner. As to the copycat accusations, it's so hard these days to determine the provenance of any recipe. I looked at Bittman's recipe (and I love his take on food BTW and can't wait to pick up his VB6 new cookbook) but I agree with Kristen Miglore that the only thing it has in common with this winner are the peas and ginger. For fun, I googled pea puree with ginger and came up with a whole BUNCH of hits. But none of them had the same dish as TasteFood's (or Bittman's). I'm assuming anyway that the win wasn't just for the pea puree; it's for the entire dish and how it works together. Bittman didn't use scallops, which with all due respect, I think is a better pairing than swordfish. And although I went through a bunch of recipes including Bittman's, none included the gremolata, which is pure genius. So, go enjoy Tastefood's dish AND Bittman's, but don't call it the same recipe. Because it isn't. I guess a lot of people don't realize that great chefs and culinary writers also need inspiration and surely they visit the culinary web just like the rest of us who like to cook. It's a mistake on the part of those who assume that a great recipe must have originated with the better known and it couldn't possible be the other way around. After all not everyone who can sing feels comfortable upon the stage. And not everyone who can sing sings original compositions. If you look at the two recipes, they have nothing in common but peas and ginger. TasteFood's recipe is thoughtful, refined, delicious, and amply deserving of this Wildcard win -- and of respect in these comments. TasteFood's recipe is deserving of respect, not so much the editorial comments. I feel terrible that Lynda has to defend herself! She has always been a creative chef that follows her own instincts for creating fresh, delicious recipes. Her body of work which she shares not only on food52 but also on her blog will show you without a doubt that she is an original and doesn't need to copy anyone. Thanks for the wildcard nod! For those of you who are implying I might have lifted this recipe from Mark Bittman, if you check it out, the original date this recipe was submitted to Food52 was April of 2010. The Bittman post was 6 months later, and for the record, I have never looked at his cookbook (which might rightly be considered even more egregious). I was pretty proud of this recipe and submission back then, and have used it with great success for a number of dinner parties and a few cooking classes. So, thank you F52 for the shout out. So clearly Mark Bittman has plagiarised you? LOL. Surely not. The recipe is not even the same - just similar. Lynda - I certainly did not intend to question your recipe. After all, there is very little new under the sun in terms of cooking and many recipes will have similarities especially when they come from educated chefs and taste buds. My actual target was the editorial comment from A&M who said, "This pea puree is unlike any pea puree we've had; it's punchy, it's gingery, it's exciting." This comment was written three years after Lynda and Mark Bittman both published their recipes. And to be honest I have tasted similar at various restaurants over the years. It is hard to believe that Amanda and Merrill, sophisticated cooks and eaters, had never experienced that combination of flavors before. Their comment seemed a bit overly enthusiastic. We've also enjoyed Bittman's recipe for some time. This smacks of plagiarism. On the part of the "author" and of Food52. Congratulations! This looks so wonderfully fresh and light. I love anything with scallops! However, that pea puree also reminded me of Mark Bittman's. and I can't eat anything with cilantro. for me, and between 15 - 20% of folks, Cilantro tastes like soap. I just sub out parsley or taragon, but lots of folks don't know to do that. I just tried this and it was AMAZING! I subbed the scallops for some tilapia i pan fried. In reply to 'rbnyc' - i believe they meant it's unlike any other pea puree they have ever had on the website.